Rain Thomas, a member of the Tseshaht First Nation, was one of the 12 individuals who were presented with the Premier’s Awards for Indigenous Youth Excellence in Sport on March 19. 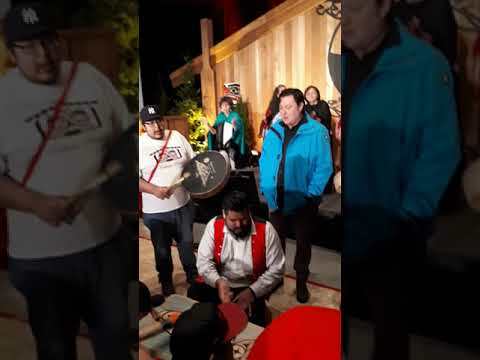 Thomas and the rest of the award winners were honored Tuesday last week during the opening ceremonies of the Gathering Our Voices Indigenous Youth Leadership Training, which was held at the Alberni Athletic Hall in Port Alberni. The Premier’s Awards are a collaboration between officials from the Province of British Columbia as well as the Indigenous Sport, Physical Activity & Recreation Council (I-SPARC), the provincial governing body of Indigenous athletics. The awards are presented each year to deserving Indigenous athletes who are under the age of 25. All of the provincial recipients had previously won a regional Premier’s Award this past fall. Thomas was one of the Vancouver Coastal winners at the regional level. Athletes honored in six different regions from across B.C. were then eligible for the provincial accolade. Thomas, however, was certainly a deserving recipient. And she believes one of the reasons she captured the provincial award is because she had success in more than one sport. Thomas’s sporting accomplishments this past year came in basketball, soccer and track and field. She believes taking part in more than one sport is beneficial. “I think it just adds another dimension to any sport you play,” she said. Thomas had also won a regional Premier’s Award back in 2016. But she didn’t go on to receive a provincial award that year. For 2018 there were 47 winners of regional awards. Then six females and six males, representing the six regions in B.C., were honored at the provincial ceremony last week. In 2018 Thomas was a member of the York House girls’ Grade 8 hoops squad that captured the gold medal at its provincial championship. She also suited up for the Venue Kings, a Langley-based club, that returned home with a gold medal from a California tournament this past November. Thomas was on her school basketball squad this season. The York House team once again advanced to its provincial tournament. But Thomas was sidelined with an ankle injury and unable to play in that recent event, held in Langley. Tests were inconclusive whether she had a ligament tear or a fractured growth plate. Thomas could only watch and cheer on her teammates as they placed ninth at their provincial tourney this year. She’s now healthy again and has returned to the court. This weekend she’ll be attending the tryouts for the provincial girls’ under-15 squad, which will be held in Langley. While in Grade 8 Thomas was also fortunate enough to compete at a provincial track and field championship. She helped her York House squad to a fifth-place finish in its girls’ 4x100-metre relay event. And she also finished 22nd in her high jump competition. Though she also earned kudos for her abilities on the soccer pitch, Thomas gave up that sport in order to focus on basketball. I-SPARC’s executive director Rick Brant had praise for all of the provincial winners of the Premier’s Award.